Bloemfontein is situated near the centre of South Africa along the N1 between Cape Town in the Western Cape and Johannesburg in Gauteng. 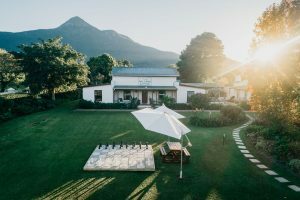 Whether you are travelling for business or pleasure, you can expect to find a choice of accommodation on offer, from hotels, guest houses, self-catering establishments and bed and breakfasts in Bloemfontein. It is true that Bloemfontein is no tourist hotspot; however, it is the perfect stopover for many travellers. Despite its laid back demeanour, accommodation in Bloemfontein is modern and as technologically advanced as its bigger city counterparts. And depending on your preferences, accommodation in Bloemfontein ranges from affordable self-catering units and B&B’s to luxurious guesthouses and lodges. 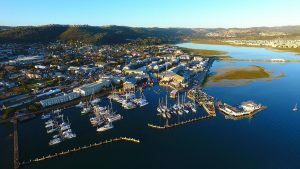 The town may not have the ocean or razzle-dazzle of urban city life but it does offer a peaceful, country stopover with all the conveniences and comforts of bigger city centres. 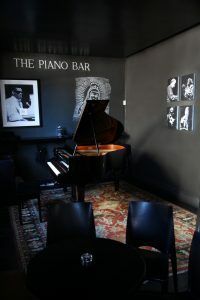 For those who have the time to explore, Bloemfontein is steeped in a rich cultural heritage. Visitors can immerse themselves in the cities multitude of museums, monuments and national buildings. There are a number of decent restaurants and activities offer and the surrounding area boasts a number of top game reserves and lodges. The Protea Hotel Bloemfontein Willow Lake is the only hotel in South Africa to be located in a zoo, providing a unique and tranquil experience all within a spectacular wildlife atmosphere. From the moment you check in, the exclusive patio area gives you breathtaking views of the Bloemfontein Zoo. Situated in the ever-growing corporate hub of Bloemfontein, The Protea Hotel Willow Lake is easily accessible both from the airport and from the N1 and within walking distance of the Loch Logan Waterfront Mall, Kings Park, Vodacom Park Stadium and close to Grey College as well as Medi Clinic. The Protea Hotel Willow Lake offers a full-service restaurant, conference facilities and an exclusive bar area with views of the Bloemfontein Zoo. The terrace and swimming pool area offers a serene spot after a hard day’s work, and a bonfire is lit every evening. Telephone 051 412 5400. Make a reservation, click here. Get there, click here. Find out more, click here. 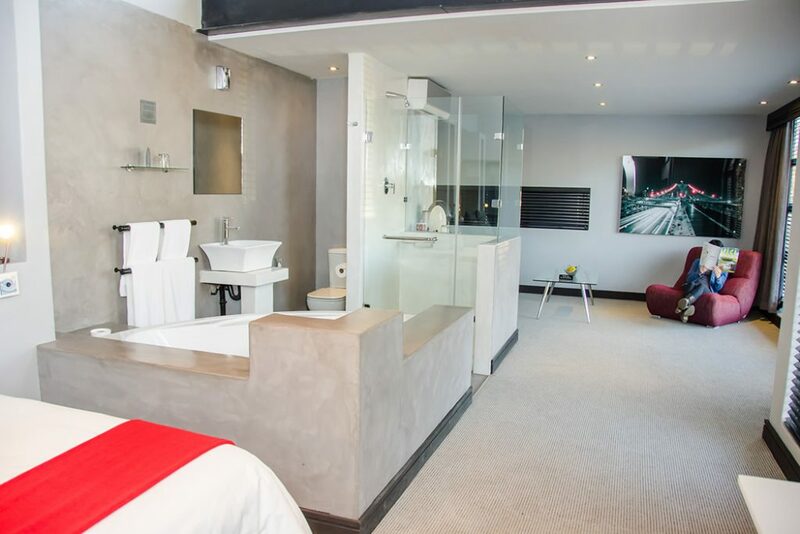 The City Living Boutique Hotel is a 4 Star Boutique Hotel in Bloemfontein, offering a modern retro element to luxury, tranquillity and unravelled style for the discerning traveller, visitor or business executive. 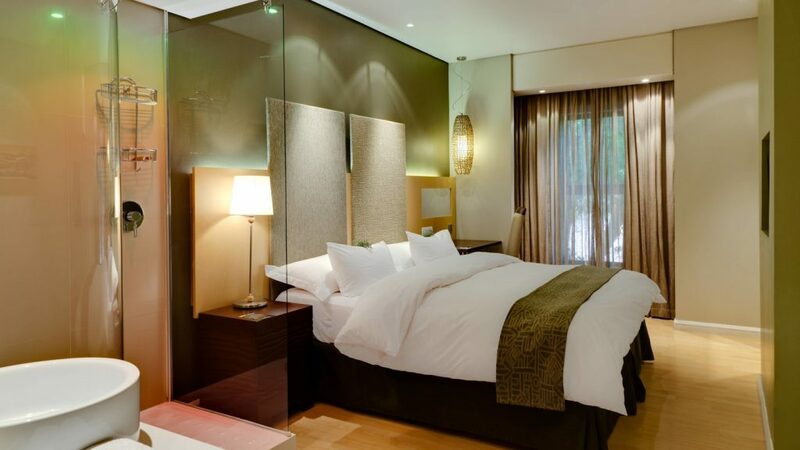 The boutique hotels luxurious rooms are ultra-modern and exude comfort. There are two executive suites, 17 luxurious double or single rooms, one family unit and one luxury apartment. The City Living Boutique Hotel prides itself in their hospitality, offering 24 hours professional and friendly staff, secure parking, and free Wi-Fi. Telephone 051 444 6688. Make a reservation, click here. Get there, click here. Find out more, click here. De Oude Kraal Country Estate is situated on a 6th generation Merino sheep farm in the Free State allowing guests to experience the true country lifestyle near Bloemfontein. Every aspect of De Oude Kraal Country Estate and Spa is inspired by a love for all things native to the Free State. The country estate offers 11 luxurious garden suits and their Merino self-catering units. 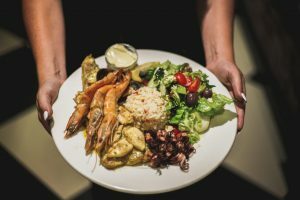 De Oude Kraal is famous for the De Oude Kraal Fine Dining Restaurant and their gourmet country deli, aptly named Feast. De Oude Kraal Country Estate also offers a Wedding and Conference Venue. Telephone 051 5640 733. Make a reservation, click here. Get there, click here. Find out more, click here. When looking for accommodation that offers comfort and allows you bring your pets along in Bloemfontein, look no further than the vintage Milner Manor Guesthouse. 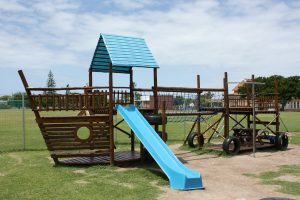 Milner Manor is located in Waverley suburb, which is situated in the northern side of Bloemfontein. Waverley is known for their beautiful old-styled houses and well-maintained gorgeous gardens. This location allows for easy access to local shops and tourist attractions. Telephone 051 436 0053. Make a reservation, click here. Get there, click here. Find out more, click here. Liedjiesbos loosely translated from Afrikaans, Liedjies ‘songs’, bos ‘bush’ is a five-bedroom bed and breakfast situated three kilometers North-west of Bloemfontein. Here you can enjoy the simple pleasures of bird songs, the song of the wind through the grasslands and trees, and the gentle sound of our ‘Ankole’ cattle grazing in the fields. Collaborating with Smit Architects, Henning de Bruin and Dawie Human, world-travelers and fanatical amateur Chefs, created Liedjiesbos to celebrate their love for nature, art, architecture, food, antiques and the pleasures of life. Telephone 083 282 5701. Make a reservation, click here. Get there, click here. Find out more, click here. 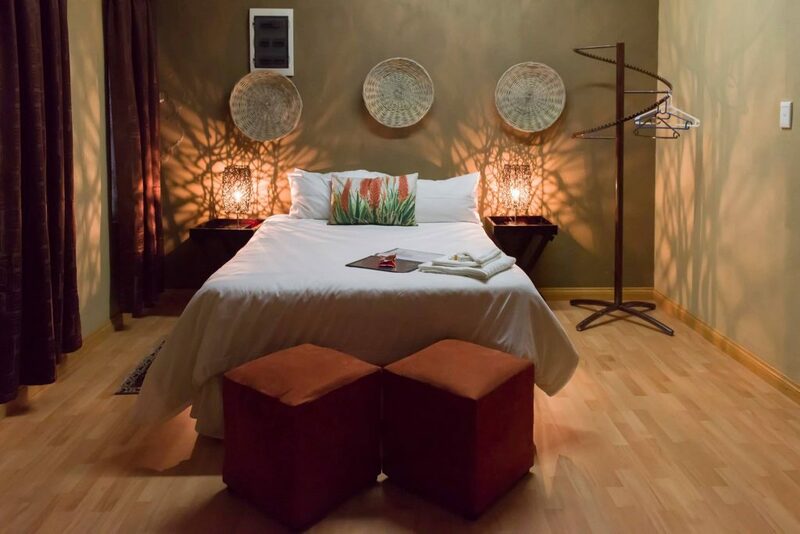 Bloemstantia Guest House is a Cape Dutch styled Guest House set in Dan Pienaar, an upmarket residential area in the northern suburb of Bloemfontein. Bloemstantia is adorned with works of art, collectable furnishing and wooden features. The Guest House offers six spacious luxury rooms, as well as single, double and family accommodation. 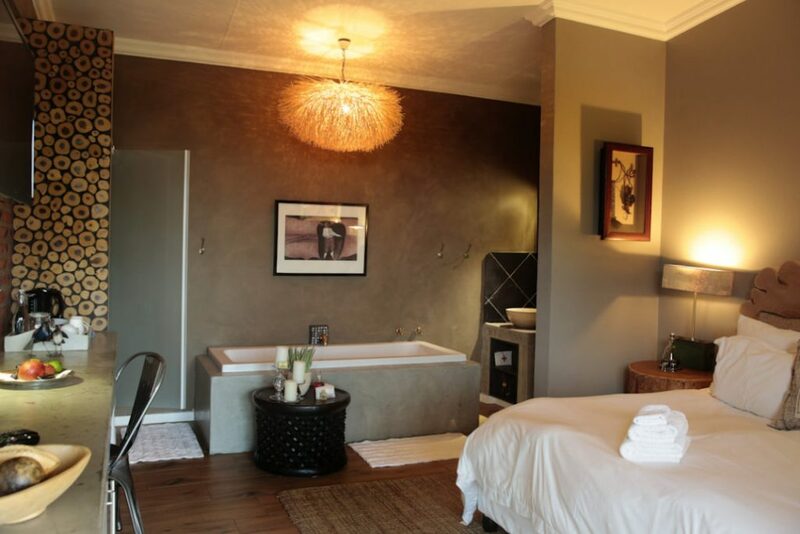 All rooms come equipped en suite bathrooms, with baths and showers. Bloomstantia caters for high profile business people, leisure guests and both domestic and international tourists. Visitors can enjoy privacy and luxurious accommodation in this tranquil setting. Telephone 087 806 9881. Make a reservation, click here. Get there, click here. Find out more, click here.